Sisters Carolyn and Joy Harvey offer exercise classes in Local Motions studio on Culver Highway. Interest in a new "Tai Chi" class being offered in Madras has been so strong that instructors Carolyn and Joy Harvey had to open a second class. 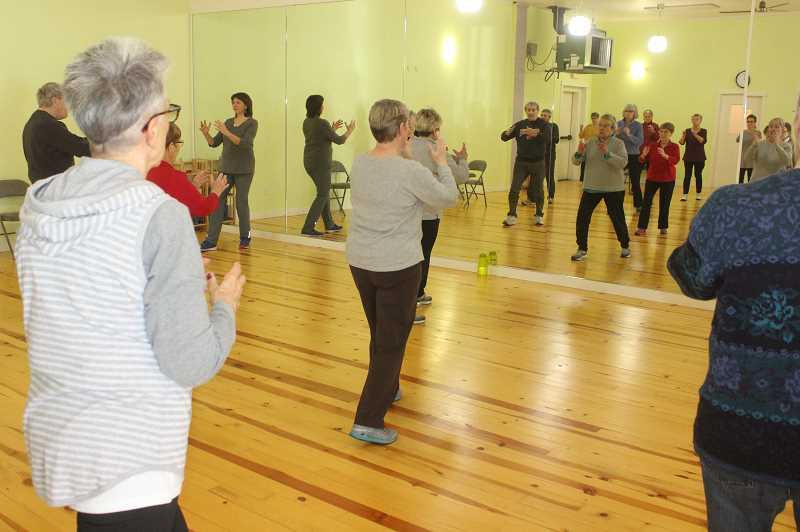 Their Tai Chi for Arthritis class, which was only advertised by word of mouth, now has 50 students in two classes, which meet on Tuesday and Thursday mornings. The majority of students are women, but seven men have also enrolled. The Harveys, who are sisters, both have health-related backgrounds. Carolyn Harvey works part time as a community health educator for the Jefferson County Public Health Department, while Joy Harvey is a retired family nurse practitioner. As part of her health department job, Carolyn Harvey also coordinates the Movin' Mountains and Cardio Challenge programs. Offering the lessons on their own, they rented a former well-appointed yoga studio on the Culver Highway, renamed it "Local Motions," and started the six-week introductory "Tai Chi for Arthritis" class on a trial basis to see how it would go. Both women have always been interested in helping people be fit and healthy. "We have been teaching group fitness classes since 1986," Carolyn Harvey noted. "I was certified in 2015 to teach Tai Chi for Arthritis, but I didn't have the time to do it then. But there is so much interest now, that I decided to do it," she added. She and Joy Harvey are both certified to teach fitness through the American Council on Exercise. Currently, Carolyn Harvey is teaching the classes, assisted by Joy Harvey and Saundra Allard, of Apex Physical Therapy, who help her demonstrate motions in front of the class. The class fee is a very reasonable $30 for the whole six weeks. "There is a real need for these types of classes. We have the perfect venue for it and are keeping the cost down so anybody can take it," Harvey said, noting their main goal is to help people exercise, while meeting the rental expenses. Tai Chi for Arthritis was developed by Dr. Paul Lam based on the "Sun" style of tai chi, which is easy to learn, safe and effective. Those with arthritis can do it, but it also has benefits for other people. People can do the movements either standing or sitting in a chair. In the class, participants learn basic tai chi movements, do warm-up and cool-down exercises, improve balance, relieve arthritis pain and stiffness, improve muscle strength and stamina, reduce stress, improve concentration, and experience the health benefits of tai chi. "Tai Chi for Arthritis is just the tip of the iceberg; there are 24 different forms of tai chi," Harvey said, noting her boss, Health Department Director Michael Baker, teaches another form at the Jefferson County Senior Center. She said Allard and Joy Harvey will also probably become tai chi certified so the Local Motion studio can offer more classes. And they plan to bring in someone to teach evening yoga classes this week. "Our goal is to continue the tai chi classes, based on the needs of the community. I think it can grow, based on what people want," she said, adding, "Everybody can do it and they don't have to feel intimidated." Students have told her they like the slow, smooth movements that make them feel graceful, and the format, where students practice the movements over and over. Two students from last week's classes commented on why they signed up for the class. "It's so good for balance," said Juanita Hawkins. "I took tai chi before in Hermiston, but it was a different form." "It's good for your brain, too, because you have to think about what you're doing. It's also kind of a workout, because you're bending your knees and concentrating on your moves," she said. Sue Hart said she took the class, "to improve my balance and learn to relax. I've never taken it before, but Juanita talked me into it."